Lanḍī Kōtal (Pashto: لنډي کوتل‎; Urdu: لنڈی کوتل‎) or Lwargai (Pashto: لواړګی‎ Lwāṛgai) is a town in the Khyber Pakhtunkhwa province of Pakistan, and the administrative capital of Khyber Agency. 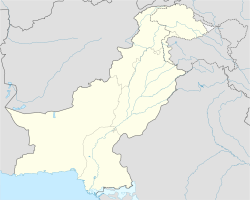 It is one of the largest towns in the Federally Administered Tribal Areas, and is located 1,072 metres (3,517 ft) above sea level, on the route across the mountains to the city of Peshawar, Khyber Pakhtunkhwa, Pakistan. Landi Kotal is at the western edge of the Khyber Pass that marks the entrance to the Nangarhar Province of Afghanistan, which is located just 5 kilometres (3 mi) to the west. Landi Kotal was the westernmost part of the Khyber held by the British during their rule of the subcontinent. In 1897 the Afridis attacked Landi Kotal and other posts in the Khyber Pass. Although the Khyber Rifles put up a stiff defence, Landi Kotal was overrun, as the Rifles lacked water. The British counter-attacked with a force of 34,500 men under Sir William Lockhart, defeating the Afridis, although the Afridis took the town again during the second Anglo-Afghan War. The Landi Kotal fort during the period of British rule was of the ordinary type, consisting of a keep and an outer fort with accommodation for 5 British officers and 500 native officers and men. From 1899, like the other posts in the Khyber, it had been garrisoned by the Khyber Rifles, an irregular corps of militia recruited from the tribes of the Khyber Agency. In 1925 the heavily engineered Khyber Pass Railway was opened linking Jamrud to the Landi Kotal. ^ "POPULATION AND HOUSEHOLD DETAIL FROM BLOCK TO DISTRICT LEVEL: FATA (KHYBER AGENCY)" (PDF). www.pbscensus.gov.pk. 2018-01-03. Retrieved 2018-04-01. ^ Landi Kotal – Imperial Gazetteer of India, v. 16, p. 134. ^ a b Landi Kotal – Imperial Gazetteer of India, v. 16, p. 135. ^ Khyber – Imperial Gazetteer of India, v. 15, p. 303. ^ Tīrāh – Imperial Gazetteer of India, v. 23, p. 390. Wikivoyage has a travel guide for Landi Kotal. This page was last edited on 14 April 2019, at 16:34 (UTC).